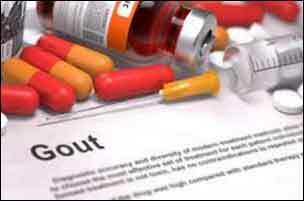 As reported in the journal Arthritis & Rheumatology, the drug febuxostat reduced gout flares in a double-blind, placebo-controlled study of 314 adults with early gout. Febuxostat treatment also reduced synovitis — or inflammation of the joint lining detected by MRI scanning — over a 2-year period compared with placebo. Febuxostat treats high urate in the blood of patients with gout. “Current clinical practice guidelines do not recommend routine use of urate-lowering therapy for people after the first gout flare. This study indicates that even for people who have had only 1 or 2 prior gout flares, urate-lowering therapy to reduce serum urate below 6mg/dL may have benefit in reducing future flares,” said Dr. Nicola Dalbeth, lead author of the study.